Judging by the time, I’m going to guess that I’m somewhere over Saskatchewan12, and so far I’ve read more than half of Sarah Silverman’s debut book The Bedwetter. Last night3, I took a walk along the Danforth in Toronto to visit the bank, and on my way back, I popped into Book City. I had two books to take with me on my trip, and though my trip is only five days, I tend to pound through the reading while on vacation, and if I’m going to attempt to visit a beach, I’ll need to find a way to not get bored, because beaches are boring. So here, I sit, laptop on tray, with a Canadian in hand4, pondering the meaning of Sarah Silverman’s book. 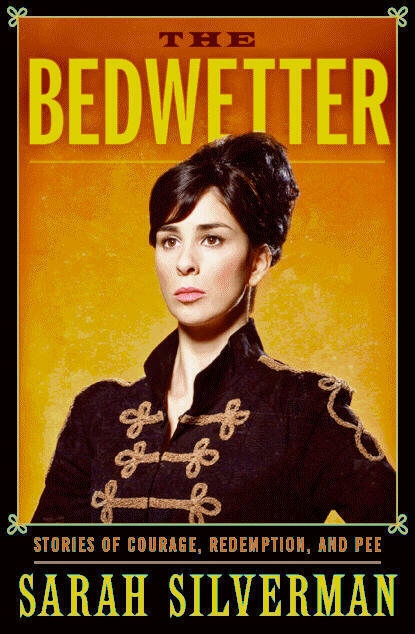 For those uninitiated, Sarah Silverman is a Jew. Oh, and she’s also a comedian, but do you really need to add that? Jew and comedian are practically synonyms, just look at me, and my hilarious Jew-ways. Silverman is the front-woman of her hilariously outrageous show The Sarah Silverman Program, and created the outstanding DVD of her standup Jesus is Magic. The book is an autobiography, and though there don’t seem to be any major life altering events, it’s still an interesting read. Silverman’s humour shines through. It perfectly excels at what it aims to be, bathroom reading to make you laugh. The only difference being that I read it on an airplane rather than on the crapper. OH! I think we’re over Alberta now, I see mountains. That was a fun trip. I took the SkyTrain into the city, and my god, the TTC could learn a thing or two from Vancouver. Then I took a short bus5 around to the area where my hotel was. I was slightly confused by the walk, but it was cool. The hotel wasn’t ready for me yet, so I had to wait, I stowed my bag and headed to the beach! So, here’s the thing about Vancouver’s beach versus Toronto’s beach. It’s a real beach. Theirs is on a bloody ocean, ours is on a lake, sure it’s a GREAT lake, but it’s a lake. It also kinda smells6. While I was on the beach, I continued reading, and even finished the book. Hooray! The book continues and gets more into her career than into just her early life. It’s really more of the same, however what I really liked was the chapter about her being a Jew. Did you know she’s a Jew?